The vegetables listed here adapt to many climates/soils and as long as they are planted at the right times they will almost always make a crop. Leaf lettuce or salad mixes need little more than sun, water, and careful weeding for three to four weeks. Sugarsnap peas require the creation of a fun and functional trellis. The plants make great use of vertical growing space. Potatoes keep producing season after season, and harvesting them feels like a treasure hunt. Green beans (also known as French beans), whether they grow on bushy plants or long vines, are often named as the easiest vegetable to grow but they generally produce all of their fruit in a relatively short period of time, then cease to produce. Swiss Chard is basically a gigantic spinach, and a few plants can produce a phenomenal amount of tender greens that keep their flavour in hot weather. Tomato growing can be easy if you choose a small-fruited variety such as early-maturing cherry or patio tomatoes. Rocket that matures in cool weather holds its savoury/spicy flavour a long time. Rocket planted in autumn is a wonderfully robust cut-and-come-again crop. Mustard Greens, Indian Mustard, Chinese Mustard, and Leaf Mustard has an abundance of fans among people who like cooking greens. Vigorous mustard keeps growing as days get shorter and cooler, even when cut back several times. Turnips can’t quite match mustard for sheer exuberance, but you get both greens and crisp roots for very little effort. Size: Once the plant has grown wider and about twice as tall as the pot it will be struggling to get enough water. You may notice that the soil is drying out more quickly because the plant is taking up the water faster and more moisture will be lost through the larger leaves, particularly if it’s under grow lights. Soil: After about 8 weeks the plant will have used most of the nutrients in the small pot and growth may slow down. Roots: Holding the plant upside down with the stem between your fingers you can remove the plant pot and examine the roots. If they are starting to go round and round the edge of the pot then the plant is in danger of becoming ‘pot-bound’ and needs more space. Leaves: Keep an eye on the plant and note if any leaves start to lose the normal vigorous green colour, curl or droop. Yellowing leaves indicate severe nutrient deficiency and ideally you want to transfer the plant well before this stage. 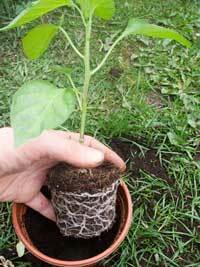 Re-pot the plant in a larger pot with fresh compost (potting soil) to give it more nutrients, water and root space. This is a delaying tactic necessary if you can’t transfer the plant when it is ready. 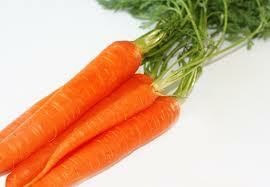 If you are planning to grow carrots, you will need to spend a large amount of time preparing your carrot bed. Carrot roots must encounter no obstructions which means removing any rocks and breaking up clods until the bed is finely crumbled, at least 12 inches deep. Three to four days before you plan to sow them, soak carrot seeds in water for an hour, and then transfer them to a damp paper towel. Fold to enclose the seeds, then put inside an airtight container. Keep at room temperature. Plant the seeds within five days. Seeds germinate in one to two weeks, depending on the weather. Once seedlings have germinated, there can be no disturbance to the soil within a thumbnail’s distance from the base of the plant. Innocently pulling a weed might have unintended effects upon the little growing carrot, so snipping with a small pair of scissors is safer than pulling when you’re thinning and weeding close to your little carrots. Once carrots are up and growing, regular water and routine weeding will get you a nice carrot crop in a couple of months. Avoid bruising carrot foliage which releases gaseous plumes that attract carrot rust fly. 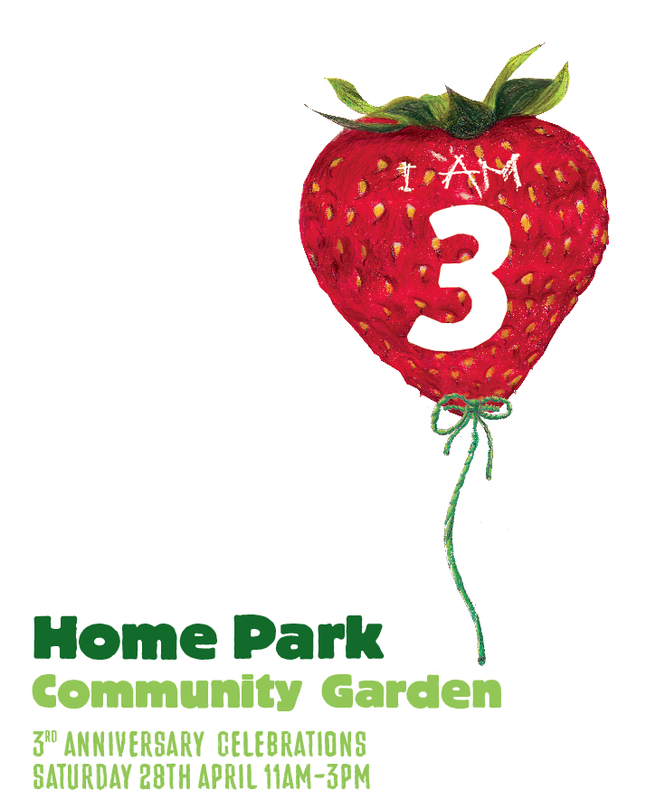 To find out more about Friends of Home Park please subscribe to our blog or like us on Facebook.